This is a wonderful and challenging foraging toy for your birdie. Hide your birdie's favorite treats inside the logs. Twist the Turn 'N Learn Logs together and hang. 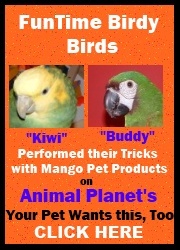 Ideal for Amazon sized birds up to Macaw sized birds. Turn N' Learn Logs Foraging Bird Toy5LoriJanuary 4, 2016My Blue and Gold loves this toy. It is sturdy and a challenge for him at least for now. Turn N' Learn Logs Foraging Bird Toy5The Licon'sMarch 7, 2014My Congo African takes a while to trust new things. She has not played with it but has taken peanuts out of the little cups. I am pleased with the quality of the plastic, it should last even when she does start to play with it. Turn N' Learn Logs Foraging Bird Toy5Scott McBainFebruary 19, 2013When we first got it, Freddy our Blue and Gold MaCaw wasn't sure about it. He saw me stick some almonds, his favorite treat, in it. He ignored it for a day or two, but utlimately he got the top one opened. It stayed that way for a week or so. I opened the next section and showed him the almonds at the bottom, and closed it back up. The next time I looked up, he had all the sections taken apart, and had scarfed up all the almonds. I praised him, and gave him a cracker, another treat he likes, and then took the log out, reloaded it, and put it back in. I was distracted for a few minutes, and when I looked back he had all the sections opened and was eating the last almond, quite proud of himself. Overall it's a big hit. Freddy loves it, and it does challenge him to open it up, and get the treats out. Turn N' Learn Logs Foraging Bird Toy5Gail PiperJanuary 11, 2012My DYH Amazon, Haley, is intrigued by her new Turn N' Learn Logs toy. She loves to forage (what bird doesn't) and this gives her several places to dig for treats. Plus, she likes to play around with it between treat times.